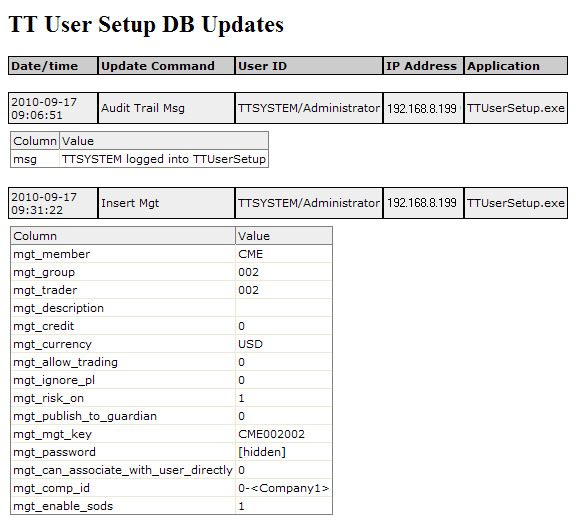 Use the Audit Trail window to track updates made to the database. Database updates are logged automatically in the UserSetupDbUpdates.ini file and include a daily record that is viewable in a standard Internet browser. Updates are categorized based on the date and time of the update, the type of update (e.g., update user email account), the username and IP address of the user that made the update, and the application in which the update was performed. 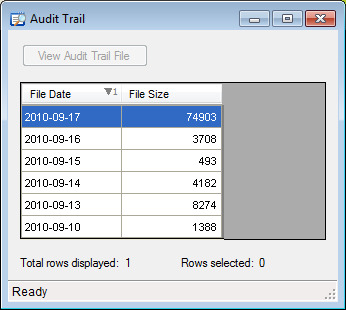 The Audit Trail window displays a list of available log files, and shows the date the files were created and the size of the log files. From the Reports menu, select Audit Trail. From the Audit Trail window, click View Audit Trail File. The TT User Setup Database Updates file appears in your Internet browser. Note: You can copy data into Excel or any other applicable application. You have successfully displayed a logfile via the Audit Trail window.